Lat 5° 27' 32S Long 148° 25' 57E	Cape Gloucester Airfield is located on the northern tip of Cape Gloucester in West New Britain Province in Papua New Guinea. Known to the Japanese as "Tuluvu Airfield". Built prewar by the Australians as a single runway for civilian aircraft known as Cape Gloucester Airfield. On December 17, 1942 at dawn destroyer Tachikaze and Patrol Boat No. 39 landed 350 Japanese troops at Cape Gloucester, under cloud cover. The detachment under the overall command of Major Kiyomitsu Mukai, the construction battalion commander, rapidly secured Cape Gloucester Airfield (No 1 Strip) and established a 40 km beachhead area. The Japanese immediately began improving and expanding the prewar runway and built a second runway (Cape Gloucester No. 2 Strip, East Airfield). Once built, the original runway became known as Cape Gloucester No. 1 (Old Strip, West Airfield). Cape Gloucester Airfield was used by the Japanese as a forward airfield for fighters and bombers from both the Japanese Army Air Force (JAAF) and Imperial Japanese Navy (IJN). On July 30, 1943 two Type 96 G3M Nell bombers from the 11th Air Fleet escorted by sixteen A6M Zeros including three from the 201 Kokutai that landed with the bombers at Cape Gloucester. Aboard one was Vice-Admiral Junichi Kusaka, commander of the Southeast Area Fleet and his staff for a brief inspection then departed transporting Major General Iwasa Shun. That same day, three Type 2 fighters (Ki-45kai Nick) from the 13th Sentai arrived as the first fighters based at the airfield. On August 2, 1943 a Ki-51 Sonia from the 83rd Dokuritsu Chutai with passenger Lt. General Hatazo Adachi, C. O. 18th Army that took off from Madang Airfield on a flight bound for Lae Airfield, escorted by nine Ki-43 Oscars from the 24th Sentai. Flying at 4,900', the formation was spotted by P-38 Lightnings escorting B-25 Mitchells on the north coast of New Guinea off Teliata Point roughly 30 miles south of Saidor. Adachi's Ki-51 Sonia dove to low level and managed to escape interception and proceeded eastward to land at Cape Gloucester Airfield instead. As of October 19, 1943 defenses included 12 heavy and 34 light anti-aircraft batteries, including fake "dummy" gun positions. As of October 19, 1943 defenses included 12 heavy and 34 light anti-aircraft batteries plus fake "dummy" gun positions. For roughly a year spanning from late December 1942 until the American landing at Cape Gloucester on December 26, 1943 Cape Gloucester Airfield was targeted by American bombers and fighters. The airfield was so heavily bombed by the 5th Air Force, a new term entered their vocabulary 'to Gloucesterize' a target, due to the pot-marked appearance of the airfield from aerial photos. After the December 26, 1943 landing by the 1st Marine Division at Cape Gloucester, the Japanese 53rd Infantry commanded by Col. Kouki Sumiya fell back to Cape Gloucester Airfield on December 29 and centered their defense on "Razorback Hill" a ridge with bunkers that spans across the southwest approach to the airfield. The 5th Marines 1st Battalions and 2nd Battalions attacked this area on December 30 supported by tanks and artillery. Overpowered, Japanese were defeated by dusk. On December 30, 1943 Marines occupied Cape Gloucester Airfield. On December 31, 1943 USMC General Rupertus held a flag raising ceremony next to the wreckage of a G4M1 Betty at Cape Gloucester Airfield No. 2 Strip. Later on March 11, 1944 Col Sith and his EO Col Henry W. Buse with a color guard of the 3rd Battalion, 5th Marines raised the same American flag at Bitokara. After capturing Cape Gloucester, the Marines located intact Ki-61 Tony 263. This aircraft was immediately recovered and transported to Australia for technical evaluation. Many other wrecks were surveyed by ATIU (Air Technical Intelligence Unit). During January 1944, American forces worked to repair the runway but heavy rains delayed repairs until the end of the month. As of January 31, 1944 the runway was 4,500' x 100', with a parallel runway under construction and the west runway used as a crash strip. "The 36th FS and 80th FS were based at Gloucester in March of 1944, but it was raining so much in April they pulled both squadrons back into New Guinea. 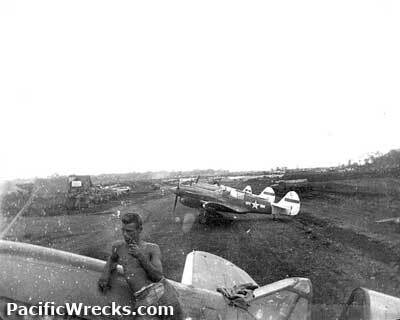 Bill Wallisch a 35th FS Crew Chief told me the mud was so bad there that they just could not operate properly." Lat 5° 27' 32S Long 148° 25' 57E Located to the west, running roughly north-west to south-east, nearest to the ocean. Built prewar by the Australian administration. The single runway was 600 yards long. When the Japanese occupied the airfield on December 17, this runway was unserviceable due to trench barricades, erosion, floodwaters and vegetation. Surveyed by on December 20, the Japanese decided to build a new runway adjacent to this runway. When completed, the runway was expanded to 3,900' runway and a series of revetments were built along the eastern edge of the strip. Largely abandoned by the Japanese, it was overgrown when captured by Marines in December 1943. Reportedly, this strip was repaired and used until 1990s, when it was deemed unsafe. This runway runs east to west. Built prewar by Australians, 750 yards long. When the Japanese occupied the airfield on December 17, this runway was unserviceable due to trench barricades, erosion, floodwaters and vegetation. Expanded by the Japanese , the first phase of construction was completed by January 15, 1943 for emergency landings 1,150m x 100m. On February 1 at 9am, a Ki-61 Dinah piloted by 1Lt. Okano and Sgt. 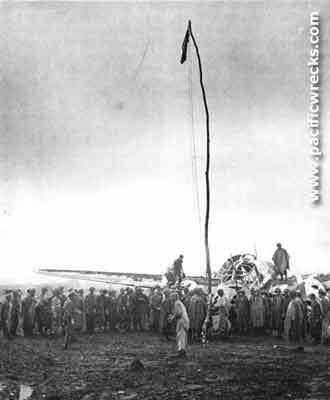 Major Kanaya landed but, flipped over damaging the aircraft and injuring the crew. 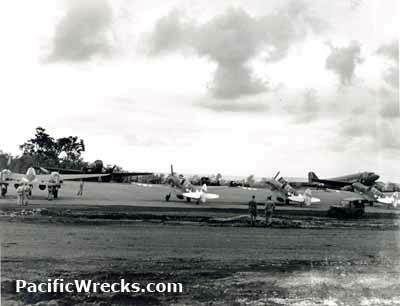 Next on February 5, four aircraft landed at 6am, likely Ki-43 Oscars of the 11th Sentai, en route from Rabaul to Lae. By February 16, the runway was observed as 3,900', later expanded to 4,500' in length, with a large dispersal loop and taxiway to the north side. This was the primary Japanese strip at Cape Gloucester. Several wrecked and some intact Japanese Navy and Army aircraft were captured at this location. Repaired and expanded by the Americans. Post war, it was disused and overgrown today. Still in use today, known as "Cape Gloucester Airport". Airport code: IATA: CGC. Serviced by secondary airlines. Occasionally, nearby volcanic eruptions temporarily close the runway. "I found the old dump at Cape Gloucester some years ago but you would need to move a bit of dirt to get at it. I recall that there were bits of Japanese aircraft sticking out of the ground."